A study in The Journal of Neuroscience by Dr. Nina Kraus shows a relationship between neural response consistency and ability to keep a beat. Dr. Kraus lab, shown here, investigates the neurobiology underlying speech, music, and learning. Credit: Dr. Nina Kraus. The findings of a Northwestern University study of more than 100 high school students lend proof to the surprising link between music, rhythmic abilities and language skills. The study—the first to provide biological evidence linking the ability to keep a beat to the neural encoding of speech sounds—has significant implications for reading, according to Nina Kraus, director of Northwestern's Auditory Neuroscience Laboratory. Previous investigations found a link between reading ability and beat-keeping, says Kraus in a study published in the Sept. 18 issue of the Journal of Neuroscience. Previous research has established a link between reading ability and neural response consistency. "By directly linking auditory responses with beat-keeping ability, we have closed the triangle," Kraus says. The study demonstrates that accurate beat-keeping involves synchronization between the parts of the brain responsible for hearing as well as movement. Where previous research investigations focused on the motor half of the equation, Kraus and co-author Adam Tierney focused on the auditory component. Because hearing sounds of speech and associating them with the letters comprising written words is crucial to learning to read, the Northwestern researchers reasoned that the association between reading and beat synchronization likely has a common basis in the auditory system. To investigate the relationship between beat-keeping and auditory processing, 124 Chicago high school students visited Kraus's lab and were given two tests. In the first, they were asked to listen to a metronome and tap their finger along to it on a special tapping pad. Tapping accuracy was computed based on how closely their taps aligned in time to the tick-tock of the metronome. In a "brainwave test," the students were fitted with electrodes measuring the consistency of their brain response to a repeated syllable. Across the population, the more accurate the adolescents were at tapping along to the beat, the more consistent their brain response was to the speech syllable. "This is supported biologically," Kraus says. "The brainwaves we measured originate from a biological hub of auditory processing with reciprocal connections with the motor-movement centers. An activity that requires coordination of hearing and movement is likely to rely on solid and accurate communication across brain regions." Accurate beat-keeping's implications for reading and language skills simply make sense, according to the co-authors. "Rhythm is an integral part of both music and language," Kraus says. "And the rhythm of spoken language is a crucial cue to understanding." For example, you might slow down your speech or stress one syllable more than another to emphasize a particular point. And minute timing differences distinguish consonants, such as "b" and "p." Hearing that timing distinction is necessary to identify the sounds with the letters that represent them. "Musicians have highly consistent auditory-neural responses," says Kraus. "It may be that musical training—with its emphasis on rhythmic skills—can exercise the auditory-system, leading to less neural jitter and stronger sound-to-meaning associations that are so essential to learning to read." 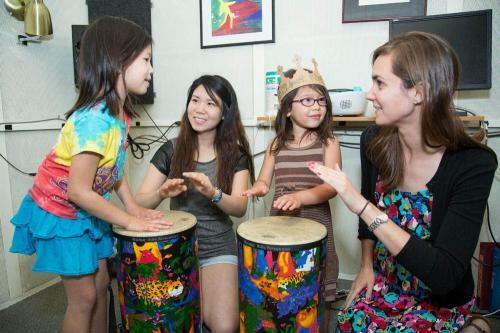 Kraus, who is the Knowles Chair in Northwestern's School of Communication and professor of neurobiology in Weinberg College of Arts and Sciences, is conducting longitudinal investigations that look directly at the effects of music training by measuring beat synchronization, response consistency, reading and other language skills in children as they progress through music instruction from year to year.